The cost of maintaining our nation’s infrastructure continues to rise, and material manufacturers are being challenged to provide better quality, more cost effective, and longer-lasting products. Since the 1880s, steel reinforcing has been used to strengthen concrete, particularly for heavy construction such as in roadways, bridges, and buildings. Now, new innovations in the industry are making this tried-and-true technique even better. For example, identifying corrosion resistant materials is an ongoing challenge when using reinforcing steel. Traditional methods for providing corrosion resistance have been to utilize coatings such as epoxy or zinc, or concrete mix designs that inhibit chloride intrusion. However, technological advancements have demonstrated that alternatives such as stainless steel may lead to longer product life expectancy and improved seismic capacities. Recording performance standards criteria for reinforced steel falls under the responsibility of ASTM International, the American Concrete Institute (ACI), and the Concrete Reinforcing Steel Institute (CRSI). These organizations exist to protect the public and drive standardization in building and construction so that owners have confidence in the structures they build. 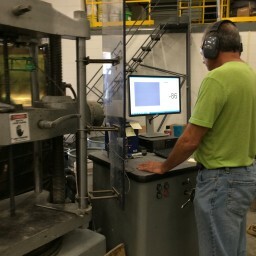 Terracon provides materials testing for owners across the country. We believe it’s important to get out in front of new innovations by providing testing and verification for materials manufacturers who are developing product alternatives to help them demonstrate that they meet established criteria. Recently, Terracon partnered with Contractor’s Materials Company (CMC) of Cincinnati, the manufacturer of ASTM A955 stainless reinforcing steel, to help quantify and document the quality benefits of their product. 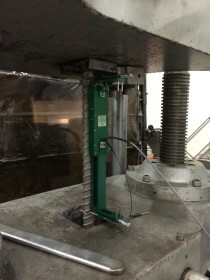 Terracon conducted numerous tests to determine how bendable, malleable, and flexible the new steel product is related to the requirements of ASTM A955, which is the standard for Deformed and Plain Stainless-Steel Bars for Concrete Reinforcement. Terracon also performed tests and provided test data for new patent designs for various types of hardware (for example, steel bars). Being involved in stainless steel innovation from the manufacturing side helps us bring more insight to a project and ensures a quality product for the owner throughout the life of the structure. Terracon is also partnering with Byer Steel Company of Cincinnati for their preparations to address the ASTM Technical Standards Committee regarding modification of ASTM A615, which is the standard for Deformed and Plain CarbonSteel Bars for Concrete Reinforcement. Byer Steel is the only U.S. producer of ASTM A996 axle steel reinforcing bars. Terracon is providing test data to demonstrate the comparative nature of these reinforcing steel bars to standard ASTM A615 grade 60 bars. Byer Steel will use the test data to propose that ASTM A996 be merged into ASTM A615. If successful, ax le steel could become an approved scrap source for ASTM A615 reinforcing steel, giving Byer expanded capability to market the product within design specifications. Terracon had previously provided chemical analysis of the axle bolts and filler slugs installed in scrapped axles as delivered to Byer Steel. In both cases, Terracon was able to provide test data showing that the bolts and filler plugs were chemically comparable to the finished reinforcing steel product which allowed for a streamlined production process. As a result, Byer Steel is no longer required to remove the attachment bolts and filler plugs prior to forging its bars, saving labor costs and allowing the company to boost production. WHAT IS THE INDUSTRY IMPACT? Reinforced steel advancements are poised to change traditional construction specifications. Fundamental design and material composition alternatives, as well as research efforts into other types of well-performing reinforcing steel, are among today’s metallurgical innovations. As a leader in material testing services, Terracon offers the knowledge and capabilities to perform testing and evaluation on many different types of materials including manufactured and existing reinforcing steel. By supporting the development and performance testing of new innovations, we are committed to helping manufacturers, designers, developers, and contractors meet the materials needs of the future.